No matter what kind of model you build in Google SketchUp, displaying it in Google Earth begins with giving it a geographic location, or geo-location for short. 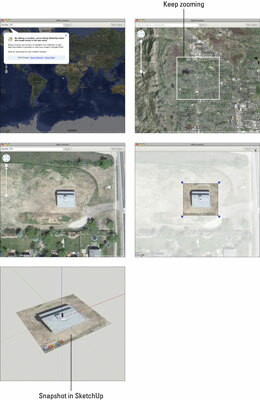 In SketchUp, geo-locating your model involves placing it where it belongs on a chunk of terrain and aerial imagery (called a geo-location snapshot) that you download from the Web. Adding a geo-location snapshot to your model in SketchUp 8 is about ten times easier than it was in SketchUp 7. The 3D terrain data in SketchUp 8’s geo-location snapshots is also more detailed and accurate than it used to be, and the aerial imagery is in full color. Open the SketchUp file you want to geo-locate. Choose File, Geo-Location, Add Location from the menu bar. Find the area where you want your model to be located. When you’re zoomed in close enough, you see a white, 1 km x 1 km square: This is the largest snapshot you can import all at once. That’s still a very big area, so you probably want to keep zooming. Click the Select Region button to display a cropping rectangle. Drag the blue pins to specify the precise corners of your geo-location snapshot. Try to frame an area that’s just big enough to provide a base for your model. Importing too much terrain data can bog down your computer. You can always bring in more terrain data later. Click the Grab button to add a geo-location to your SketchUp file. The separate window closes, and a big, colorful rectangle appears in the middle of your model. That’s your new geo-location snapshot. If you’re geo-locating a model you’ve built already, move it into position on the snapshot. Choose File, Geo-location, Show Terrain to switch to the 3D version of your geo-location snapshot. Select everything you want to move and use the Move tool to start moving; tap the up- or down-arrow key to constrain your move to the blue axis. Sink your model into the terrain until it sits properly — avoid the dreaded floating model syndrome at all costs. If you want to import another snapshot into SketchUp, you can. SketchUp automatically tiles all the snapshots you “take” to form a patchwork in your model. This is super-handy if you find that you didn’t get everything you needed the first time.